HELP TURN OUT THE VOTE! Be creative and try also posting pictures of your employees who vote. In a prominent place, display these posters with or without employee pictures. 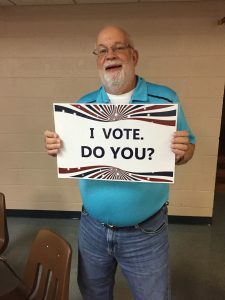 Let the community know you support strengthening our democracy through voting. We educate citizens about issues, legislation, and candidates. April 23, 2019- Toast to the life of past president, Maryanna Quilty. 5:30-7:30 p.m. at Southwest Office Plaza, 3601 SW 29th Street. Memorial donations in Maryanna’s name will be used to underwrite events marking the 100th anniversary of the 19th Amendment during 2019 and 2020. Checks should be made payable to LWVTSC. April 27, 2019- State League Convention at the Bluemont Hotel in Manhattan, Ks. Early-bird registration is $60.00 before April 20. Registration is $65.00 after that date. Register now. Tuesday, March 5, 2019 at noon, Topeka Public Library, the LWVTSC presents Dr. Kerry Wynn, Associate Professor of History from Washburn University. She will discuss her project of interviewing women who engaged in political and social movements in the 1970’s and 1980’s. 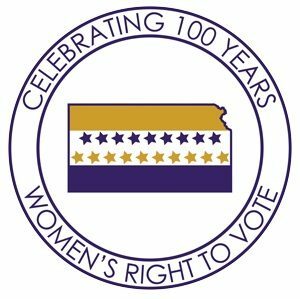 Sunday, March 10, 2019 at 3:00 p.m., Pat Michaelis, speaks about the highlights of women’s suffrage in Topeka and Shawnee County. The presentation will take place at the Historic Richie House, 1118 SE Madison. Our League continues to meet and upcoming events will be announced as finalized. The public is invited to attend any of these events. We publish monthly newsletters summarizing our local activities. The April newsletter is now available. To view the revised plan and issue papers, see http://snco.us/planning.